This week Jason and Gabe take a look at the weird and wonderful Star Wars toy commercials of the 1990s! It was a time when Luke and Han had giant muscles and everything was BIG & BLAZING!! Hear them talk about being fans in that era, how Star Wars toy crazy they were then and just how much Jason paid for a Lando figure and a French Speeder Bike back then! Before all that there is the news with Donnie Yen playing piano, Han Solo stuff, Rian Johnson talking Episode 8 and news on Blast Points going to Disney World! So celebrate the love and listen today! visit the Blast Points website! blastpointspodcast.com reviews! articles and tons more! if you dug the show please leave BLAST POINTS a review on iTunes and share the show with friends! If you leave an iTunes review, i will read it on a future episode! honestly! 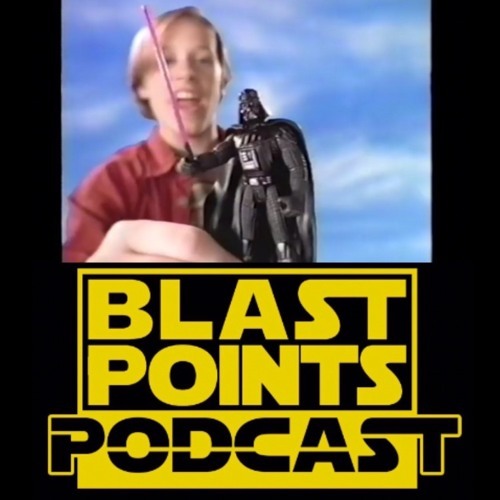 talk to Blast Points on twitter at @blast_points leave feedback, comments or ideas for shows! also like Blast Points on Facebook for news on upcoming shows and links to some of the stuff we talk about in the show!! we are also on Instagram! Wow! your hosts are Jason Gibner & Gabe Bott! contact Jason at Gibnerd@hotmail.com May the Force be with you, always.